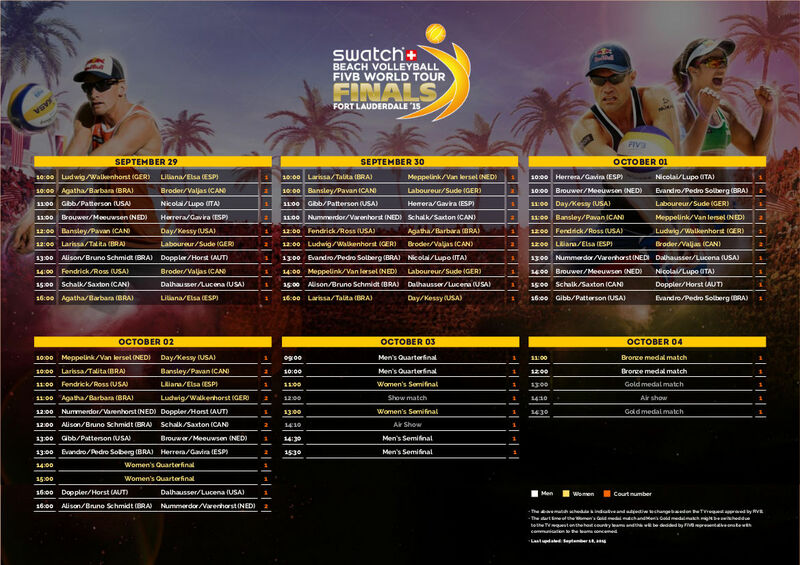 Fort Lauderdale, USA, September 18, 2015 - The International Volleyball Federation (FIVB), the governing body for international volleyball and beach volleyball, has announced the team pool assignments for the inaugural Swatch Beach Volleyball FIVB World Tour Finals in Fort Lauderdale, to be held from September 29 through October 4. The tournament will make history with the greatest total prize pool ever at $500,000, as well as an FIVB record $100,000 purse for each winning team. Men’s and women’s first place teams will also receive a custom-made trophy designed by Brazilian pop-artist and South Florida icon, Romero Britto. The competition brings together the best beach volleyball players from around the globe to square off in head-to-head matches for six straight days in Fort Lauderdale. Included in the men’s and women’s fields are 17 Olympians. Among those are 11 athletes who have netted gold medals at the FIVB World Championships. The Swatch FIVB World Tour Finals promises to be beach volleyball’s premiere event. It will feature the top eight point leaders from the 2015 FIVB World Tour based on points from the FIVB Beach Volleyball World Championships in the Netherlands, five Grand Slam events, three Major Series stops and six Opens, as well as two wild cards from each gender. The ten teams on the men’s and women’s sides have been placed into two pools of five teams each for round-robin play; this will take place during the first four days of the event and will feature six straight hours of world-class action on the stadium’s Center Court. The top three teams in each pool will then advance to single-elimination knockout rounds, with the top team in each pool advancing directly to the semifinals. The remaining two teams on each side will meet in quarterfinal matches. The women’s quarterfinals will be played on Friday, October 2, and the men’s quarterfinals will be played on Saturday, October 3. The semifinals will be played on Saturday as well and can be viewed on the Universal Sports Network. Medal matches will take place on Sunday, October 4 and will air live on NBC at 14.30 EDT. “It is a big honour for the athletes, the top players of the world, our fans, my team and myself to be able to stage the Swatch Beach Volleyball FIVB World Tour Finals - a worldwide premiere here at this fascinating spot here in Fort Lauderdale,” said Beach Majors CEO Hannes Jagerhofer. Breaking down the teams by pool, Men’s Pool A will consist of USA’s top-seeded Jake Gibb/Casey Patterson, the Netherlands' fourth-seeded Alexander Brower/Robert Meeuwsen, Brazil’s fifth-seeded Evandro Goncalves/Pedro Solberg, Spain’s eighth-seeded Adrian Gavira/Pablo Herrera and Italy’s ninth-seeded Daniele Lupo/Paolo Nicolai. Competing in Men’s Pool B will be Brazil’s second-seeded Alison Cerutti/Bruno Oscar Schmidt, the Netherlands’ third-seeded Reinder Nummerdor/Christiaan Varenhorst, Canada’s sixth-seeded Ben Saxton/Chaim Schalk, Austria’s seventh-seeded Clemens Doppler/Alexander Horst and USA’s 10th-seeded Phil Dalhausser/Nick Lucena. On the women’s side, in Pool A will be USA’s top-seeded Lauren Fendrick/April Ross, Brazil’s fourth-seeded Agatha Bednarczuk/Barbara Seixas, Germany’s fifth-seeded Laura Ludwig/Kira Walkenhorst, Spain’s eighth-seeded Elsa Baquerizo/Liliana Fernandez and Canada’s ninth-seeded Jamie Broder/Kristina Valjas. The group for Women’s Pool B will be Brazil’s second-seeded Talita Antunes/Larissa Franca, Canada’s third-seeded Heather Bansley/Sarah Pavan, Netherlands’ sixth-seeded Madelein Meppelink/Marleen Van Iersel, USA’s seventh-seeded Emily Day/Jennifer Kessy and Germany’s 10th-seeded Chantal Laboureur/Julia Sude. The new beach volleyball challenge system also will be featured at the Swatch FIVB World Tour Finals, following the system’s introduction at the Rio Open from Sept. 2-6. More than 30,000 spectators are expected to witness the action at Fort Lauderdale Beach Park over the six days of competition, with many more tuning in worldwide to find out who will be crowned the first-ever 2015 FIVB World Tour Champions. **Editorial Note: Through the Red Bull network, hi-res video and still images are captured and made immediately available for editorial use for all media channels including television, film, print, mobile, and digital. The content is centrally located in the Red Bull Content Pool for media partners at https://www.redbullcontentpool.com/content/beachvolleyball.